It is a very rare opportunity that 6 members of Didgori will be touring Canada from late May to mid June 2019. The last and only time a choir from Georgia was touring Canada was in the 1970s. This time, Didgori will not just be performing but also hosting singing workshops, with stops in Edmonton, Winnipeg, Toronto, and other parts or Eastern Canada. Scroll down to view their Canadian tour schedule to date. The award winning Didgori ensemble has been performing internationally since 2004 and has toured Russia, Turkey, UK, France, Switzerland, Israel, Poland, Uzbekistan, the Czech Republic and Latvia. Declared an Intangible Cultural Heritage of Humanity by UNESCO in 2001, the millennial old Georgian polyphonic singing tradition, with its close harmonies and untempered scales, is often described as transformatively visceral. It features 3-part singing in a variety of styles, from hauntingly melismatic lyrical genres to exploding counterpoint. As can be heard from the variety of songs in the above sampler, Didgori are masters of a variety of Georgian musical styles, the wide variety of which reflects the diverse and complex landscape that has housed the Georgian people for thousands of years. Didgori is dedicated to the traditions of their ancestors through mastery and popularization of Georgian polyphonic folk songs and chants, and to the hope that their efforts will inspire future generations. The name, Didgori, honours a historical battle in 1121 that helped reunite Georgia and ushered in a period of growth in arts and culture. Watch them perform (and even dance!) an Abkhaz round dance in the video above or listen to a performance of a chant in the audio player below. More dates to be listed soon for concerts in Kingston and Belleville, as well as cameos and workshops in Montreal and elsewhere in Quebec! GABO’s TRIO is Gabriel Makharashvili, Andrea Kuzmich and Mario Morello. Formerly known as Trio From Canada, they first formed in 2016 to sing at the biennial Symposium on Traditional Polyphony in Georgia, Eurasia. They represented two polyphonic traditions that are practiced in Toronto: Georgian polyphony and Ukrainian ridnyj holos. Towards the end of their 2016 trip, after singing at many Georgian family tables, they started being called Gabo’s Trio. Andrea – an ethnomusicologist and performing musician – and her 10-year-old son, Gabriel, are both part of the Makharashvili family, a singing family that performs Georgian polyphony for private family and calendric events and cameo appearances on stages in Toronto, New York and Georgia. Mario, an ethnomusicologist, Balkan-singing specialist and student of Georgian polyphony, will join Andrea and Gabo to sing songs from the Makharashvili repertoire and elsewhere. See GABO’s TRIO before they leave for Georgia!! The christening of the name GABO’s TRIO happened in the fall of 2016, towards the end of our trip, at this most hospitable home in celebration of the grape harvest. 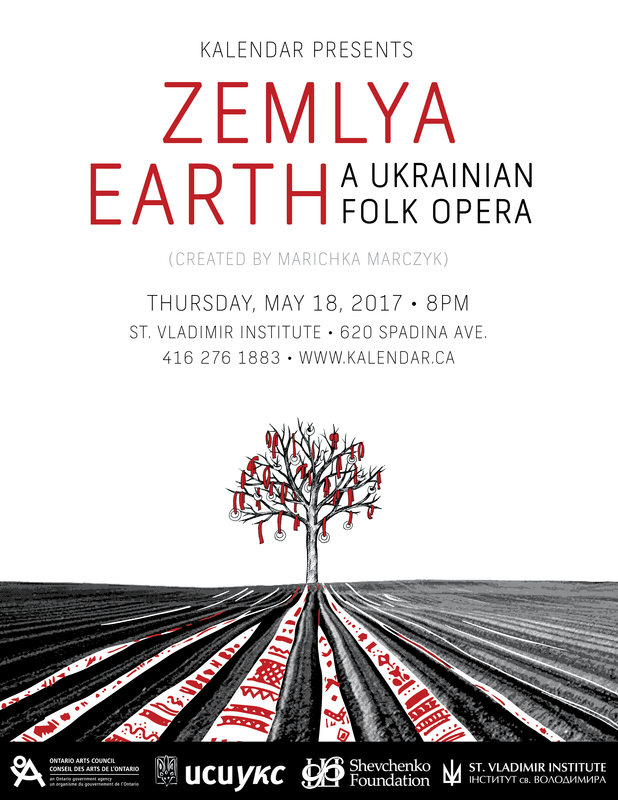 ZEMLYA / EARTH is an innovative interdisciplinary original work that features a contemporary context for the powerful and ancient women’s singing tradition of the Ukraine, a polyphonic tradition that has too often been overlooked – by Western academia and the rest of the world. Growing up with Ukrainian grandparents, I often heard and sang Sovietized arrangements of folk songs. I always thought they were beautiful but, like most of the world, never thought much of the singing tradition. I only discovered how intense and varied their polyphonic tradition was about four years ago. The remarkable thing is that most people – even musicologists and ethnomusicologists – have no idea about this ancient and powerful tradition. So it gives me great pride to be a part of an innovative approach to presenting the music: a folk opera! This project was initiated by KALENDAR, a performance singing group that grew out of the Kosa Kolektiv urban folk movement. With grants from the Ontario Arts Council, the Shevchenko Foundation, and the Ukrainian Credit Union, we were able to commission the expertise of ethnomusicologist/musician Marichka Marczyk – who is not only the co-created of the award winning Counting Sheep but has also spent over 15 years collecting songs in the fields of Ukraine and has an incredible ability to teach and share the essence of these songs with us. The show will premiere with only a single performance scheduled at St. Vladimir Institute on May 18, 2017. It is my hope that Zemlya‘s presentation of the ancient powerful women’s musical tradition (which involves choreographed movement, traditional dance, and background video) will reveal an ageless purpose of the music and viscerally remind us of the universal relationship humans have with the earth and each other. For more information visit www.Kalendar.ca or visit KALENDAR’s FB event page.